Investors can now review heat maps for a wide range of financial markets via the FinancialSpreads.com Research and Data section. FinancialSpreads.com, the UK financial trading website, now gives its clients free access to heat maps for a wide range of UK and international shares. The heat maps, which have been created by Digital Look, give investors a quick view of the market hot spots and cold spots. The maps can be used to review shares listed in a particular country, or on a specific stock market index, and therefore highlight which shares are rising/falling the most over a given time period. The mapping can be used to give a quick overview of the current broker buy, hold and sell opinions. It is also possible to drill down and see historical opinions and target prices. The Director Deals heat maps highlight which firms are being bought and sold the most by the people who run the firms. For example, a trader could opt for a heat map which shows the MACD for shares in the S+P 500 index. 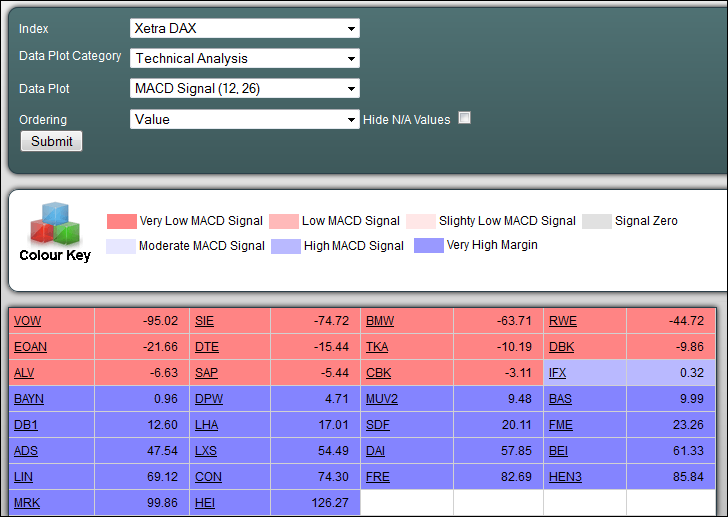 The map would quickly highlight which shares have a low, very low, high or very high MACD signal. Research and data tools are provided by third parties which are completely independent from Financial Spreads and should not be taken as investment advice. Further details, including how to access the heat maps, can be found on the financialspreads.com website. With a FinancialSpreads.com account, investors can access over 2,500 global markets including stock indices like the UK 100 index, forex markets like euro/dollar and commodities like gold and crude oil. A broad range of individual shares listed on stock exchanges in the UK, America, France, Germany, India, Ireland, Scandinavia, South Africa and Spain is also available. Financial Spreads is a trading name of London Capital Group Ltd (LCG) which is authorised and regulated by the Financial Conduct Authority.